At some point in the night, Heidi sat up straight and made a hurried exit. I listened for any sounds of distress but heard none. I figured she must have misjudged the amount of water she consumed before bedtime and would be back soon. I lowered my head and passed out. An unknown amount of time passed and there was a rustling outside the tent. Shortly after, Heidi's head popped in from the vestibule. It was dim inside the tent. There was a dull orange glow cast from the colored nylon illuminated by a nearly full moon. In the dim light I could already make out the discomfort in her face. She looked at me and tersely announced, "I just shat a liter of water." I was still completely wiped out from the previous day's bout with altitude symptoms but was alert enough to know this was a terrible turn of events. Summit day was two days away and she was looking bad. 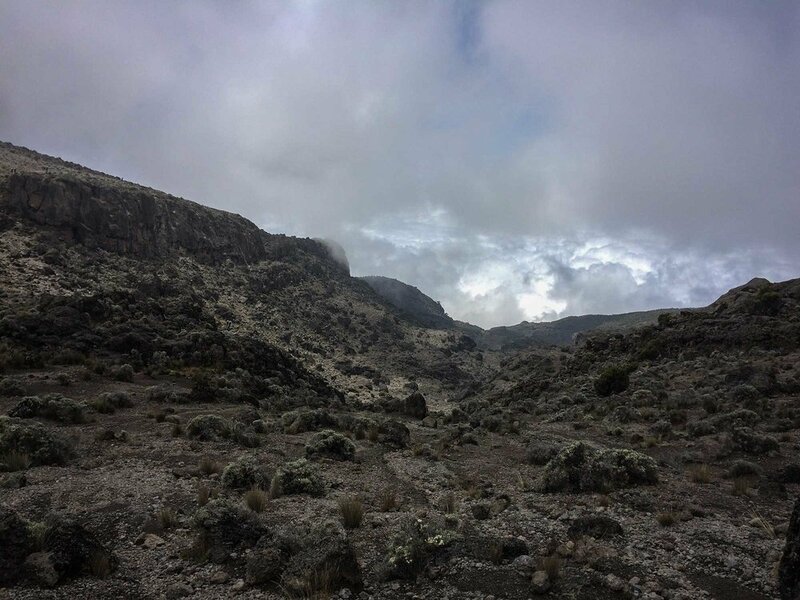 Plus when morning arrived we would be climbing the steepest part of the route, the Barranco Wall... And Heidi is afraid of heights. The boys from Seattle. John on the far right would join me for a week on the PCT two years later. Poor Heidi was a wreck by this point. I informed the guides of the situation with Heidi and that I was feeling a bit better. They suggested we let one of them carry Heidi's pack. It was tempting but they had enough to worry about keeping an eye on all the climbers. Instead, I strapped her pack to mine and we set off. Very quickly the trail went from horizontal to vertical as the ungainly queue of client, porter, and guide slowly slithered up the side of the hill. Above us, porters hauling their own equipment in packs and their client's equipment in giant duffles on their heads teetered as they reversed direction up a switch back. Disaster on this section of trail always seemed around the corner. One slip above could easily send a porter or duffel careening downward off the rocks into a everyone below. The Barranco Wall has a bit of light scrambling and the exposure will get your heart beating a bit faster. It was exhilarating. I never felt that it was treacherous or that we were in imminent danger. After about 15 minutes of minding Heidi and dealing with the dramatic change in grade of the trail I was feeling exceptionally comfortable. I still focused on taking care of Heidi, and did not shoot many images, but I was secretly having the time of my life. I like hikes with a bit of risk to them. After an unknown time we crested the top of the wall. How Heidi managed, I'll never quite know. She was pale and out of it the entire time, always on the verge of complete exhaustion. To this day, she still has no memory of that day, which I suppose is an acceptable compromise since had she remembered, the exposure may not have agreed with her. From the top, we experienced spectacular views of the approach we hiked yesterday evening, and then eventually over the top of the wall. The perspective at this altitude can play trick on the eye. Without being able to see a horizon and without reliable reference objects to gauge scale it became hard to know if I was looking slightly up or down at the landscape. I felt a slight twinge of vertigo, but was able to keep it at bay with a bit of concentration. About a half mile out from camp, we saw two familiar and friendly faces. Our porters Omben and Elibariki had finished their chores and set off backward on the trail to find us. They greeted us and we took a short water break before they liberated us from our packs and ran them up the hill to our tents. We pulled into camp dead last in our group. Most of the porters were chilling on a giant boulder where they were able to get a bit of cell signal. They were listening to or watching a soccer match and based on the excited whoops and hollers every few minutes it sounded like things were going in their favor. 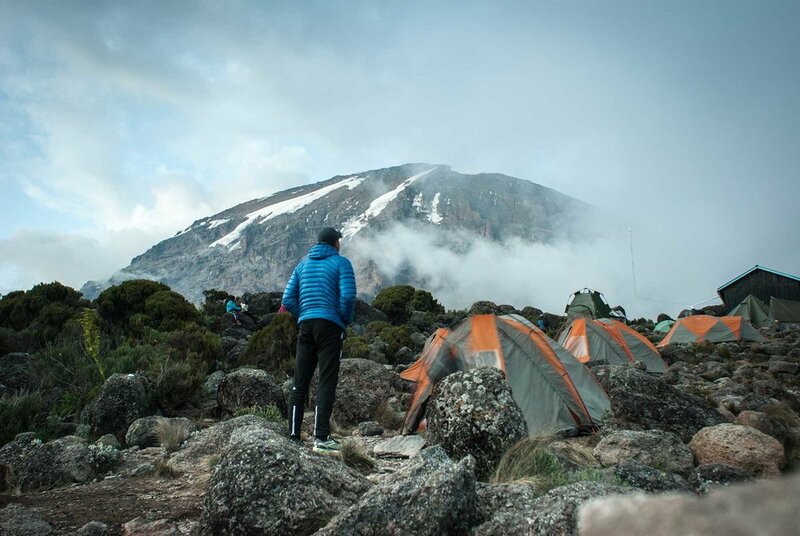 Heidi collapsed into the tent as soon as we arrived in Karanga Camp. The guides suggested she take her Cipro in order to have a shot at the summit. In about 18 hours we would be departing for the summit. It was critical that she nuke the stomach bug and get as many nutrients back into her system. 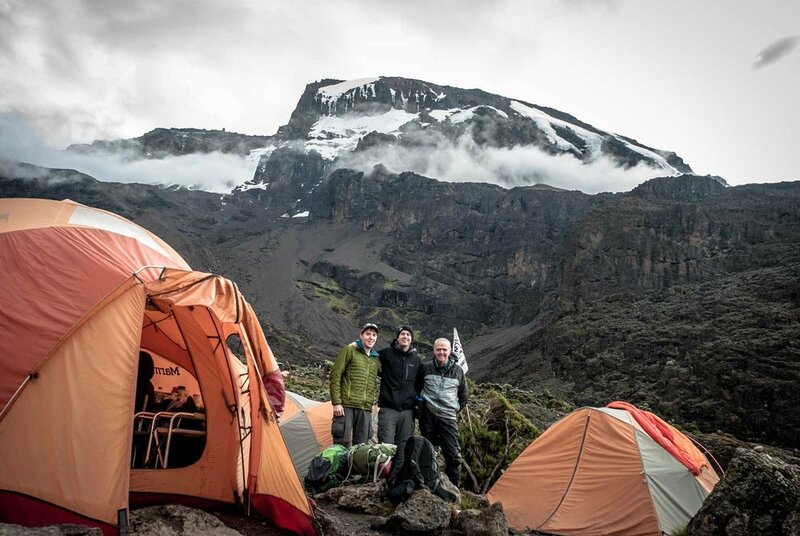 Karanga camp has outstanding views of the Kibo summit cone. We all took turns posing in front of it before the evening cloud cover rolled in. But once the last rays of sun were gone the clouds disappeared and revealed a surprising sight. The town of Moshi was right beneath us. About 10,000 feet beneath us. After five days of hiking, it felt like we were deep in the wilderness and it was jarring to see signs of civilization so close to us. And odd to think about how out of reach Moshi really was. 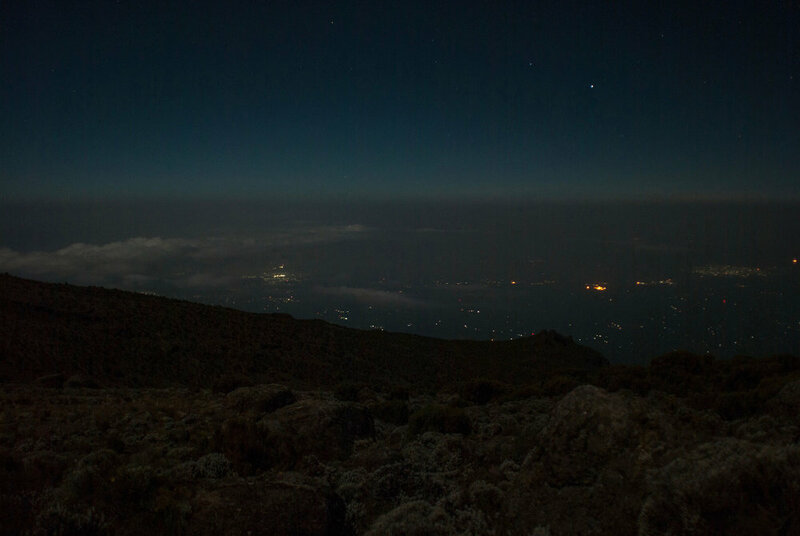 The town of Moshi a mere 10,000 feet below us could be seen from Karanga Camp. One by one the climbers had their last tea or hot chocolate in the mess tent and climbed into their sleeping bags and zipped their tents closed. One more day of hiking and we would be at basecamp and it would be time for the summit climb. It was getting difficult to sleep now. Was it the altitude or the anticipation? 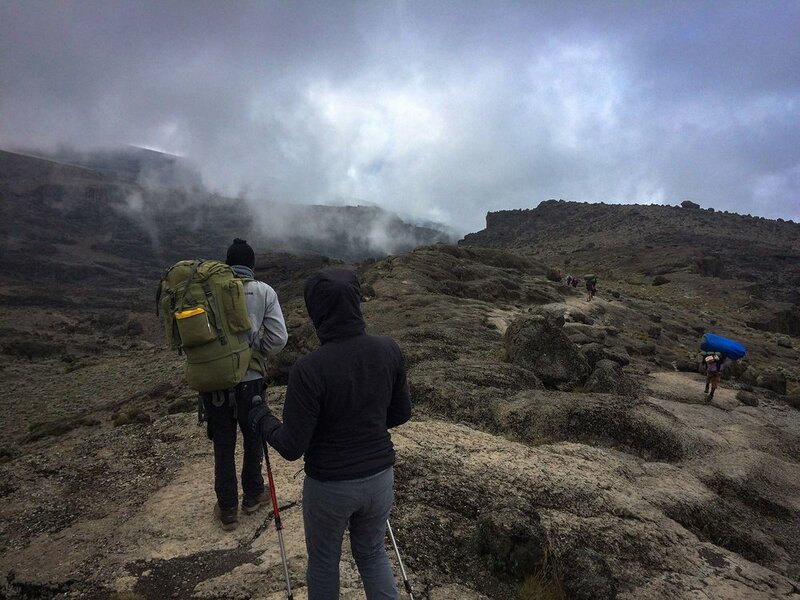 Welcome to the fifth day of our eight-day Kilimanjaro climb. If you’re just tuning in, you may want to start at the beginning of the adventure.